As usual with Nintendo’s classic game services, Switch Online’s NES app now has more games in Japan than it does in the rest of the world. While today’s worldwide update included Blaster Master and Zelda II, Japan also got a very cool fighting game called Joy Mech Fight. Fortunately, since Switch is region-free, anyone with an Online account can play it. Joy Mech Fight, developed by Nintendo in 1993, had a clever solution to this problem. The adorable robot characters that made up its roster of fighters didn’t have arms or legs. Instead, they were made up of free-floating heads, torsos, hands, and feet. This meant that they could be composed of small, manageable sprites, and also that each of their fighting moves could be animated simply by moving those sprites around, rather than having to draw (and store on the expensive cartridge space) new art for each move. That poster is definitely advertising a live show with Yoshi and Mario. The efficacy of this scheme thus rests on the quality of the animation, and Joy Mech Fight does a great job of it. You quickly forget that they don’t have limbs. Your mind sort of fills it all in. It’s tough to understand it just looking at screenshots; you’ve got to feel it in action. Especially for an NES game, Joy Mech Fight is quite feature-rich. Each of the 36 (!) robot fighters in the game has four special moves, and before you start a fight, you can go into a practice mode to see how each of them are performed, then try them for yourself. When you successfully pull one off in battle, the name of the move is shown underneath your fighter’s life bar. The moves themselves are often cribbed straight from Street Fighter, like a rapid leg kick similar to Chun-Li’s or a Shoryuken-like jumping uppercut. Only delivered by a cute robot. Sukapon showed up in Smash recently. You can jump straight into a versus match (against the computer or a second player) from the main menu, but there’s also a lengthy single-player mode. You begin as the “comedy robot” Sukapon, recently seen in Super Smash Bros. Ultimate as an assist trophy. As you defeat your competitors in the single-player mode, you unlock them as playable fighters. Once you get all eight of the starting fighters, you move on to Stage 2 to fight different robots. 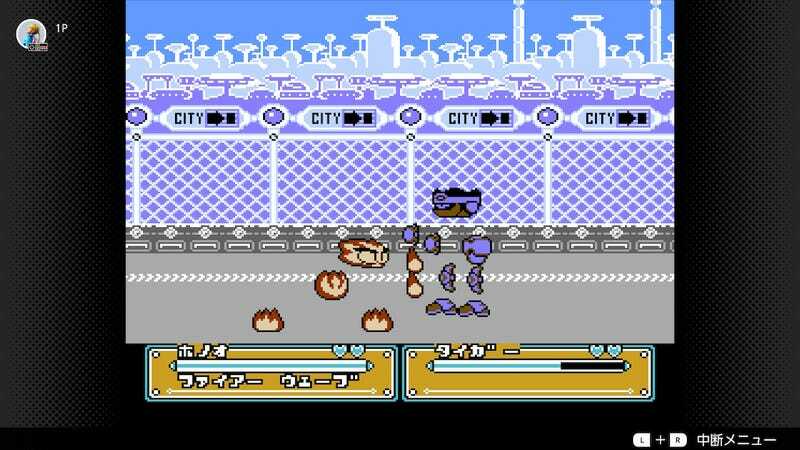 While it was a popular and well-liked Famicom game, Joy Mech Fight was never released outside Japan. While it would have been nice if Nintendo had taken the opportunity to release it here on Switch, the fact that the platform is region-free means that you can still play it. If you have a paid Switch Online account in the U.S., you can create a free Japanese account, download the Famicom games app, and be playing Joy Mech Fight within minutes. You may have to muddle through some simple Japanese-language menus to get going, but once you get past that, Joy Mech Fight speaks only in the universal language of face-punching.